An unnamed private investor has acquired the majority of Shadow Mountain Marketplace, a 359k sf community shopping center in Las Vegas. The $67.25 mil acquisition did not include the 154k sf Costco anchor store, giving the deal a price of $329/sf for the 204.4k sf that transferred. The property was sold by Wynmark Company, who developed the center in 2007 and has owned/managed the property ever since. 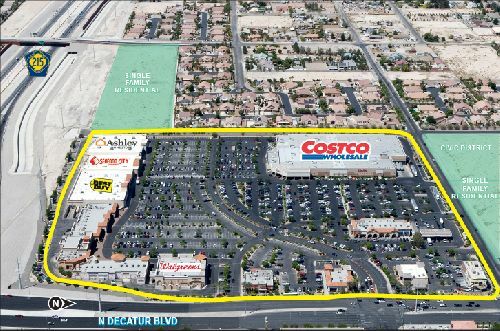 Anchor tenants include Seafood City Supermarket, Walgreens, Best Buy and Ashley Furniture, along with the Costco, which features a full size grocery department. The property is 98.9% leased, and more than 84% of the leased space is occupied by regional and national tenants, including McDonald’s, Chili’s, Wells Fargo Bank, Panda Express, Subway, Sport Clips, Massage Envy, Wing Nutz, T-Mobile, Best Mattress, Café Rio, Pacific Dental, Kumon Learning Center, Scottrade, Great Harvest Bread Co., State Farm Insurance, H&R Block and Omega Studio Salons. Located at the northwest quadrant of I-215 and Decatur Blvd, the most dominant intersection within the trade area, the property is highly visible and easily accessible from all four directions. Additional retailers at this intersection include Target, Walmart Supercenter, WinCo, Sprouts, CVS, Ross Dress for Less, Bed, Bath & Beyond and Hobby Lobby. Within a one-mile radius of the property, the average household income is $87,076 and within a three-mile radius the population is 126,340. Mark Lucescu of Lucescu Realty represented the seller and also procured the buyer in the transaction. According to Lucescu, the institutional-quality center is one of the most dominant and successful centers within the entire Las Vegas Valley, with a blue chip tenant roster, an infill location, and high barriers of entry. Robert Farrell with Lucescu Realty Asset Services has been retained to oversee the management and leasing of the property for the new ownership.